The book of Ruth is a love story. It is a love story between Ruth and Boaz, one that illustrates the love and loyalty between God and his people. 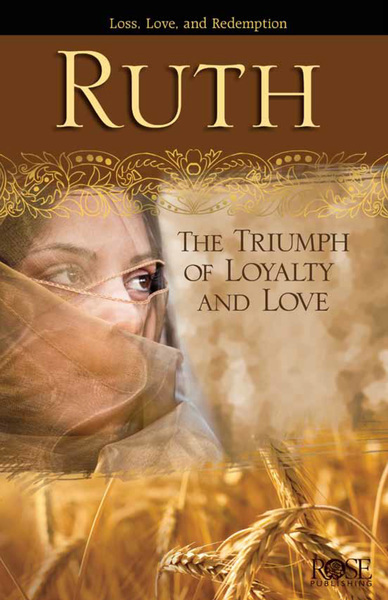 This Ruth Bible study emphasizes God's unfailing love, loyalty, and faithfulness in all circumstances and it encourages the reader to have the kindness of Ruth and Boaz. This ebook includes a great overview of the book of Ruth, covering the lives of Ruth, Naomi, and Boaz, as well as the historical and biblical background of Israel during that time. Gain fresh insights into this most beloved story and be amazed by God's unfailing faithfulness once again. This 14-page ebook explains the story of Ruth, Naomi, and Boaz in an easy-to-understand way. It separates this epic love story into scenes, covering each portion of the story's significance. Discover how politics, economics, and geography affected these Bible people. Why did Naomi's husband move to Moab in the first place? Why didn't the Israelites get along with the Moabites? And more. Explains the Significance of the Cultural Customs Mentioned within the Book of Ruth. Ruth took home more than 10 times the average salary of harvesters when she worked in Boaz's field. Both Boaz and Ruth are praised for showing Hesed, a type of love that suggests taking loyalty, commitment, and compassion a step beyond what is simply required. In the story of Ruth we encounter loss, suffering, disappointment, uncertainty and bitterness. But we also find good news; we find love, commitment, perseverance, hope, and God's powerful guidance in the midst of trials. Even though Ruth wasn't an Israelite, she was called by God to something much greater than anyone expected: She is one of only five women listed as an ancestor of Jesus Christ. Her story is a reminder to us all of God's unfailing love and faithfulness. This Ruth Bible study tackles issues we all face today, making it perfect for a women's Bible study group, for anyone who wants to learn more about the women of the Old Testament, or for anyone needing a fresh reminder of God's enduring love and guidance.